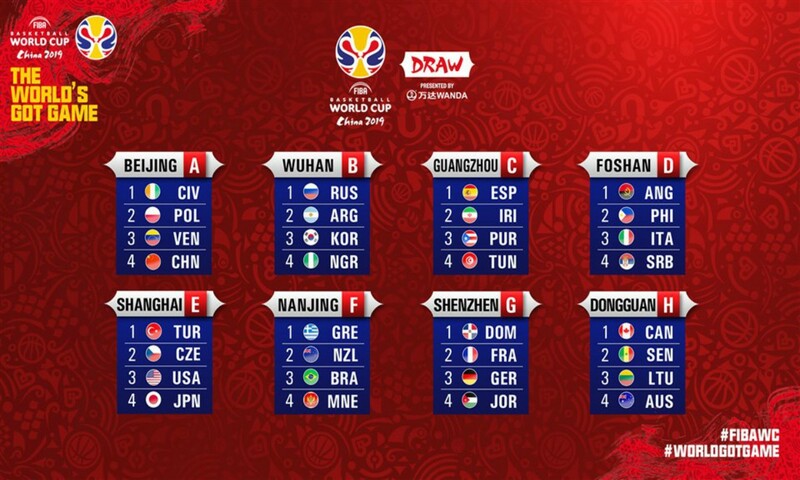 China: As the draw and schedule for the 2019 FIBA World Cup has been finalized last week, all the thirty two qualified teams competing for the coveted prize are wary of their opponents. Data4Basketball looks at the prospectus of major teams that qualified for the China World Cup and has assimilated all the available reactions and strategies of coaches and players who will lock horns for the highest prize in basketball. Sapin who have won 10 out of 12 in their European Qualifiers campaign was drawn along Iran, Puerto Rico and Tunisia in the group stage of the world cup. Spain are No. 2 in the FIBA World Ranking presented by NIKE while Puerto Rico (No. 16), Iran (No. 27) and Tunisia (No. 51) are distinctively behind the former champions. Sergio Scariolo took over as the head coach of Spain in 2009 and led the team through the 2012 Olympics . After a two-year break, he returned to guide Spain at FIBA EuroBasket 2015 and has been in charge every year since. Talking about Spain's opponents Scariolo reportedly said that it won’t be too easy for them though their group opponents may appear not so complicated to beat on paper. Scariolo, but seems more focused on the second round where Spain would have to meet stronger teams like Serbia or US. Scariolo is wary about the opponents he has to meet in the second phase, especially Serbia and Italy. Considered as the most dangerous African team, Angola were drawn in Group D along with Serbia, Philippines and Italy-one of the toughest group in the World Cup group stage. Angola’s veteran shooting guard Carlos Morais expressed his excitement of playing against some of the best teams in the world. The 33-year-old player who sat out the last edition of the FIBA Basketball World Cup in 2014 due to an injury hopes to turn things around said that he is ‘excited and motivated’ to play against the best teams in the world. The veteran and his teammates are keen to show the world- the evolution of Angola basketball in recent years." The former African champions, who qualified for the China 2019 showpiece by finishing second in Group E of the African Qualifiers with a 9-3 mark, faced Serbia three years ago at the 2016 FIBA Olympic Qualifying Tournament in Belgrade. He considers Italy as a highly motivated squad, but believes that the African side could advance past Group phase if they prepare well. Morais who recently have played for Italian club Sienna finds Italian style of basketball very similar to Angola’s and admitted Europeans as a physically dominating side. As one of the most experienced player on the Angolan team, Morais warned about their opponents strongest points. The experienced player expects World Cup teams tend to bring tall and athletic players . Morais believs bringing in young players like Valdir Manuel, Bruno Fernando and Silvio de Sous who are currently playing outside of Angola will increase the squad strength of the team. Germany were drawn into Group G along with Dominican Republic, France and Jordan. The top two teams then advance to the Second Round, where Germany would then be matched up with two teams from the tough Group H- which includes Canada, Senegal, Lithuania and Australia. Germany head coach Henrik Rodl after the draw said they were lucky not land in the USA group , but admitted the cross over group will be ‘brutal’ . The team's captain, Robin Benzing, also reflected the thoughts of his coach but said he is currently focused on the group phase first. The South Americans ended up in Group B with Russia, Korea and Nigeria. The games will be played in Wuhan. Experienced Argentinian caoch Sergio Hernandez reacted to the draw by saying he ‘accepted’ the group they got and said his team’s impressive run in the WC qualifiers a good first step. But Sergio reminds that every game in World Cup is crucial and said there won’t be any easy opponents in the tournament. He said he’ll prepare his team upto the ‘required’ standard. Russia were fourth at FIBA EuroBasket 2017, Korea third at the FIBA Asia Cup 2017 and Nigeria were runners-up at FIBA AfroBasket 2017. Argentina, runners-up at FIBA AmeriCup 2017, had a great Americas Qualifiers campaign for the World Cup, winning 9 of their 12 games. The country has appeared at every World Cup since 1986 and nearly won the title in 2002 but lost to Yugoslavia in the Final in Indianapolis. Team Pilipinas ended up in the Group D together with European powerhouse teams Italy and Serbia along with elite African squad Angola. Pilipinas head coach Yeng Guiao knows the increased level of difficulty that awaits his team in Foshan, China, where Group D's games are set to be played. Guiao feels Philippines are the ‘overwhelming underdogs’ in their group, but said that the Asians won’t just go the World cup to participate instead will give a good account of themselves. The Philippines are ranked 31st in the world, while Serbia is ranked 4th , Italy 13 and Angola 39th. This will be the Philippines' 6th appearance at the World Cup and 2nd straight after making a name for themselves in the 2014 edition in Spain, where the Filipinos delivered scares to some elite international sides like Croatia, Argentina and Puerto Rico. They ended their 2014 campaign winning just 1 game (against Senegal) and losing their other 4 assignments. Guiao although admits that they are the weakest in the group but expects to win at least one or two matches that might let them advance to second phase. He accepted that both Serbia and Italy are two powerhouses but thinks Philipines has a chance against Angola. Team Pilipinas veteran player Gabe Norwood also shared his excitement to play against world's best basketball teams . Cote d'Ivoire who are placed in Group A alongside hosts China, Poland and Venezuela is a surprise package at this World cup. The 'Elephants' head coach Paolo Povia insisted they got used to being outsiders. Ranked 64, Cote d'Ivoire is the lowest-ranked team - according to FIBA World Ranking presented by Nike - in the 32-nation FIBA Basketball World China 2019. Head coach Paolo Povia is excited to turn the fortunes around as they did the impossible mission to qualify and that too by beating a strong Nigerian team in the qualifiers. After losing five games in the African Qualifiers, the Western Africans came out of nowhere in the sixth and final qualifying window in their largest city of Abidjan . Cot De Ivory not only pulled an upset over Nigeria, beating them 72-46, but they also outscored Mali and Rwanda by large winning-margin, which were good enough to become Africa's best third-placed team and complete the continent's five-team line-up for the China World Cup. Povia accepted the fact that playing China in front of their home fans will be challenging but he added his team has group of warriors who are used to being outsiders. He also doesn’t see Poland and Venenzuela slightly. Povia thinks his team is motivated by their own recent past as they overcame some really hard barriers before being qualified. He feels the strongest aspect of the African side will be their ‘togetherness attitude’. He also expects the team to win at least two games and hopes to advance past the group phase. France are in Group G with the Dominican Republic, Germany and Jordan and if they finish in the top two, will face what many already view as a fierce crossover with Group H, which has Australia, Canada, Lithuania and Senegal. France team coach Vincent Collet said the draw as a difficult one especially considering the crossover second phase with Group H toppers. About the group stage Collet said his team should be prepared to face a Dominican team that is strong and athletic and a Jordan team –which the French team doesn’t know much about. Collet is also prepared for Germany , against whom the French coach want a ‘revenge’ for their elimination from FIBA EuroBasket 2017 . "We will have to perform right from the start of the competition in order not to dent our chances of going far in this FIBA Basketball World Cup 2019": Collet stressed. Germany eliminated France in the Round of 16 at FIBA EuroBasket 2017 in Istanbul. Only the teams that end up in the top two of each of the four Second Round groups will advance to the Quarter-Finals. France, who won 10 of of 12 games in the European Qualifiers, enjoyed their best-ever finish at a World Cup five years ago when they came in third place. Australia head coach Andrej Lemanis said that they have to be ready to go from game one and should be extremely focused with their preparation. The Boomers were drawn into Group H of the World Cup, joining European giants Lithuania, loaded Canada and a dangerous Senegal. Australia's Group H games set to be played at the Dongguan Basketball Center in Dongguan city. Despite being a top seeded team in their group, coach Lemanis knows it'll be a big challenge awaiting them at China . However he feels with the draw finalized they have a clear idea about how to prepare for every team. Lemanis feels that for an international event like World Cup is all about being ‘amorphous’ as they have to compete against teams of different playing styles. USA were drawn in a competitive Group E with Turkey, Czech Republic and Japan. USA Basketball and national team coach Gregg Popovich feels there are many national teams who have a ‘legitimate’ shot of winning the world cup. He feels other teams of Group E –the Czech Republic, Japan and Turkey are well coached teams with variety of playing styles. Popovich said that preparing his team in a short period of time is a challenging task. Since their 101-95 defeat to Greece in the Semi-Finals of the 2006 World Cup, the USA have not lost in the competition en route to titles in Turkey (2010) and Spain (2014). Adding to that success the three straight gold medal achievements at the Beijing (2008), London (2012) and Rio de Janeiro (2016) Olympic Games and the Americans have been at their best. Placed in Group E together with European contenders Turkey and Czech Republic and the world beaters United States- the two-time reigning world champions, Japan but are undeterred about their chances at the World Cup. Japan Basketball Association (JBA) President Yuko Mitsuya said Japan players are actually excited to play against the world class US team and feels it will be a huge asset for Japaneese Basketball to play against the US.